Economy Otoscope with Clip Trigger. Requires two AAA batteries (included). Comes with reusable ear specula. 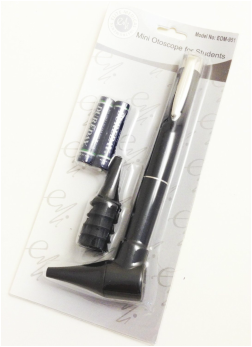 Elite Medical Instruments Hard Case Basic Economy Otoscope to learn on or home use. Perfect for Medical students and nurses. Comes with button trigger. Comes with a reusable speculum and two AAA batteries.